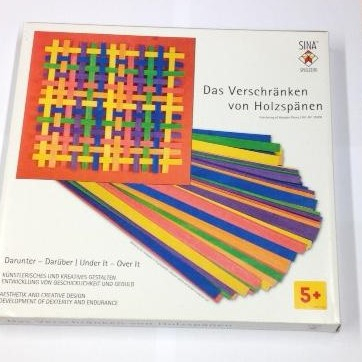 This is a \"game with lines\" based on Froebel's 'occupations'. Wooden pieces in the colours of the rainbow are joined to form two-dimensional patterns. Coloured cards are provided as a background for created designs. They harmonise with the colours of the wooden pieces. Under it - Over it. Aesthetic and creative design. This is a "game with lines" based on Froebel's 'occupations'. Wooden pieces in the colours of the rainbow are joined to form two-dimensional patterns. Coloured cards are provided as a background for created designs. They harmonise with the colours of the wooden pieces. 120 wooden pieces in the colours of the rainbow, 250 mm long, 10 mm wide, 1 mm thick, 4 coloured cards.